We are indeed aware of the counter-claim that the hazards of the polio vaccine outweigh the benefits. But that is not relevant to the hidden history revealed in this article. 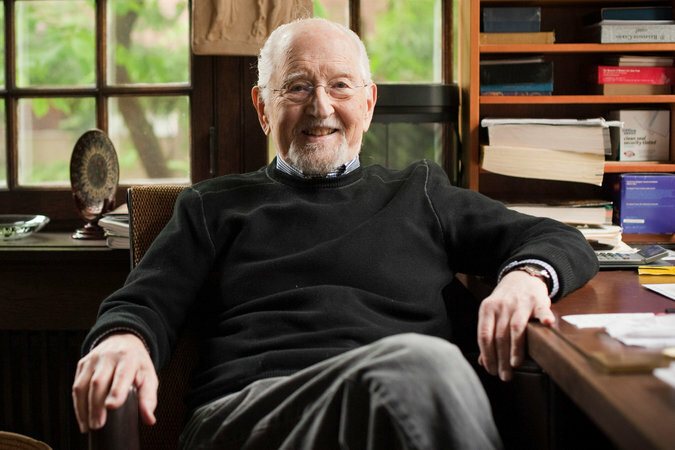 Dr. Julius Youngner, a virologist and a key member of the team that developed the Salk polio vaccine in 1955 has died at his home in Pittsburgh at the age of 96. His death is a good occasion to expose Dr. Jonas Salk (cough cough) for the selfish and over-rated, self-aggrandizing jerk that he really was. Dr. Youngner was the last surviving member of a predominately Jewish-dominated research team (Salk, Youngner, Lewis & Friedman) assembled by Salk at the University of Pittsburgh to develop a vaccine to fight polio, which had peaked in the United States in the early 1950s. Salk was actually in a race to develop the vaccine -- against another glory-seeking Jewish scientist named Albert Sabin, from Chicago. 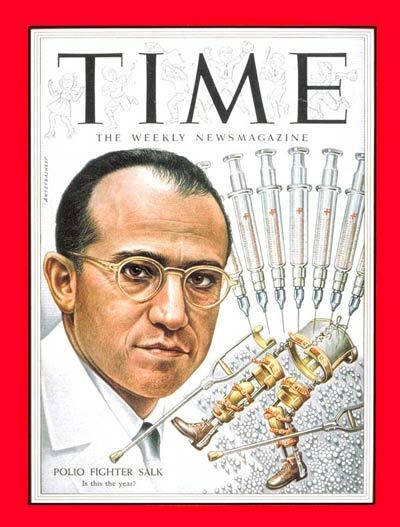 Salk's team got there first, but when Salk announced the development of the polio vaccine on April 12, 1955, he soaked up all of the press hype for himself while barely mentioning the critical contributions of the other team members. 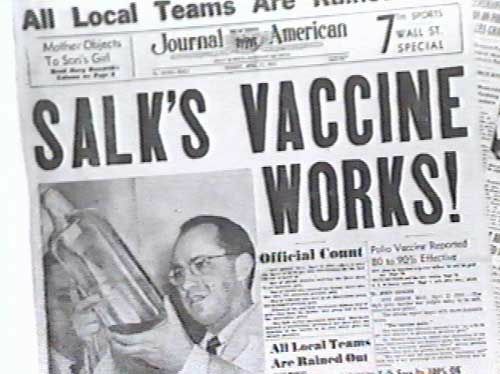 After rushing his vaccine and announcing it to Judea's Piranha Press, media-hound Salk was all about Salk. Just weeks after the vaccine had been declared safe, more than 200 polio cases were traced to lots contaminated with virulent live polio strains. Almost all of those stricken became paralyzed and eleven died. The haste (both of Salk and the Federal government under Eisenhower) to rush the vaccine to the public was responsible for this tragedy. Though this Slimes article about Youngner downplays and rationalizes St. Salk's selfish snubbing of his colleagues, its portrayal of the team members' resentment is accurate. "While Dr. Youngner, who was 34 at the time, remained at the university and made further advances in virology, he and other members of the team remained embittered that Dr. Salk had not singled them out for credit in his announcement speech. In 1993, Dr. Youngner crossed paths with Dr. Salk for the first time since Dr. Salk had left for California in 1961. 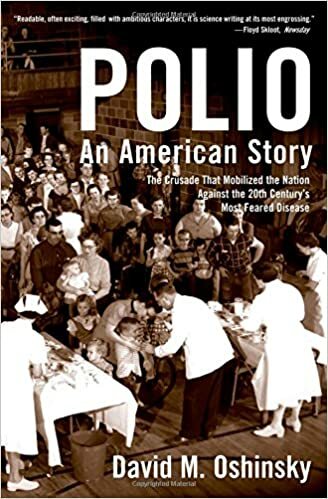 According to “Polio: An American Story” (2005), by David M. Oshinsky, Dr. Youngner raised the 1955 announcement speech in confronting Dr. Salk. Dr. Youngner’s contribution to the team were critical -- particularly the method he developed for generating the necessary quantities of the virus for experiments and production of the vaccine. He was also able to deactivate the virus while still allowing it to produce antibodies. And finally, he devised a test to measure antibodies in the blood to determine whether or not the vaccine was working. 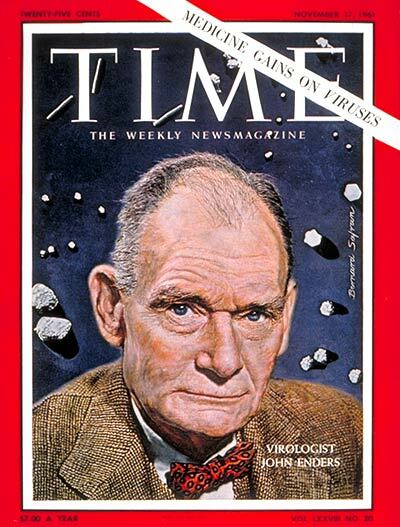 Without Youngner, the vaccine would not have been developed -- at least not at that moment in time. 1. A recent photo of Youngner. 2. Oshinky's book revealed how Salk's team members were "devastated" at being rendered "invisible." 3. As it was with Albert Einstein, the nation was instructed to worship the newest Jewish superman, St. Jonas Salk -- who was only the project manager. To add insult to injury, Dr. Salk’s wife later called Mrs. Youngner and said, 'You know, we’re really disappointed in your husband, because he hasn’t called Jonas and congratulated him.' Mrs. Youngner responded with a brusque reply, and the two couples, who had once been close, never socialized again." Wow! Just wow. Can you believe the unmitigated "chutzpah" of Salk's yenta bitching to Youngner's yenta about Salk not receiving a congratulatory phone call from Youngner?! 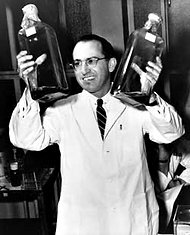 To put it all in terms of an analogy to American Football, Salk's "accomplishment" is the equivalent of a third-rate football player coming off the bench with only seconds remaining on the clock, punching the winning "touchdown" into the end zone from just 1 yard away, showing off by spiking the football in celebration and doing an end-zone dance, accepting the Most Valuable Player of the game award, granting interview after interview to the fawning Piranha Press, and finally, solely on the basis if that single 1-yard score, being inducted into the Pro Football Hall of Fame -- all while the grueling work of the talented players who had driven the ball for the other 99 yards is ignored. The Jewish super-hero has been honored with headlines, statues, postage stamps and award after award after award -- all based on the research and creativity of others who have been ignored. The Slimes headline reveals that the hasty nationwide administering of the shots was set to begin in less than two weeks! Youngner does not deny that Salk was a capable scientist. But St. Salk's intentional, pre-meditated and selfish hogging of all the credit - even to the exclusion of the fellow tribesman who probably deserved the most credit of the 6-member team - tells us a whole lot about the low down and dirty character of yet another of history's "great men" that has been placed upon a pedestal for us to worship. 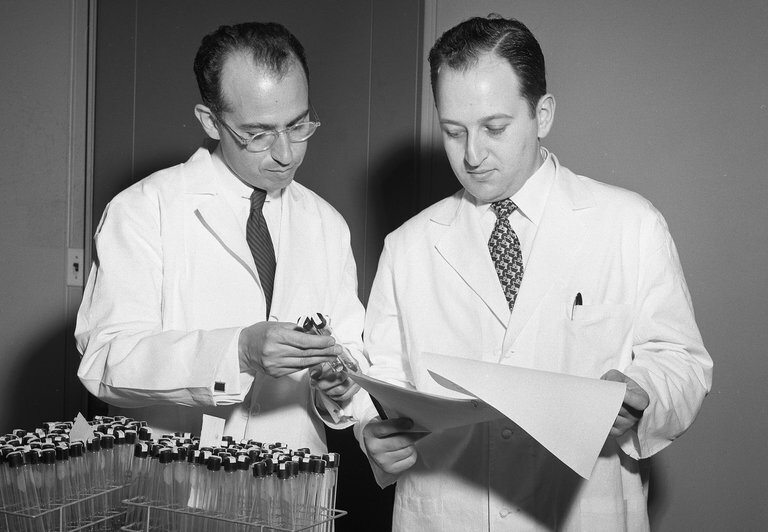 Apart altogether from the contributions from other members of Salk's Jewish research team, there was the pioneering work of several HUGE contributers to the field, whose earlier independent research was critical to understanding the polio virus and developing a vaccine. Four of these non-Jewish scientists (Enders, Hammon, Bodian, Horstman) were briefly mentioned on page 21 of the Jew York Slimes issue dated April 13, 1955 --- the same issue that had tribesman Salk, and only Salk, splattered across its front page. A well-funded, publicity-seeking Jewish scientist from Pittsburgh assembled a team of other Jewish scientists for the purpose of beating yet another well-funded, publicity-seeking Jewish scientist from Chicago in the race to develop a polio vaccine. To achieve their objectives, they all had to rely upon the earlier ground-breaking research of long-since-forgotten White Gentile scientists. When the team of Tribesmen in Pittsburgh developed the vaccine first, the organizer of the team then cheated his fellow Jewish scientists out of the credit that they wanted as well! Oy vey, as the chosenites like to say! Ya just can't make this stuff up. Salk and Youngner stood upon the shoulders of scientists that Sulzberger's Slimes relegated to a small corner of page 21. Why weren't any of the other researchers ever honored? 1. Salk, with his family, honored by the fiend Eisenhower at a White House ceremony. 2. 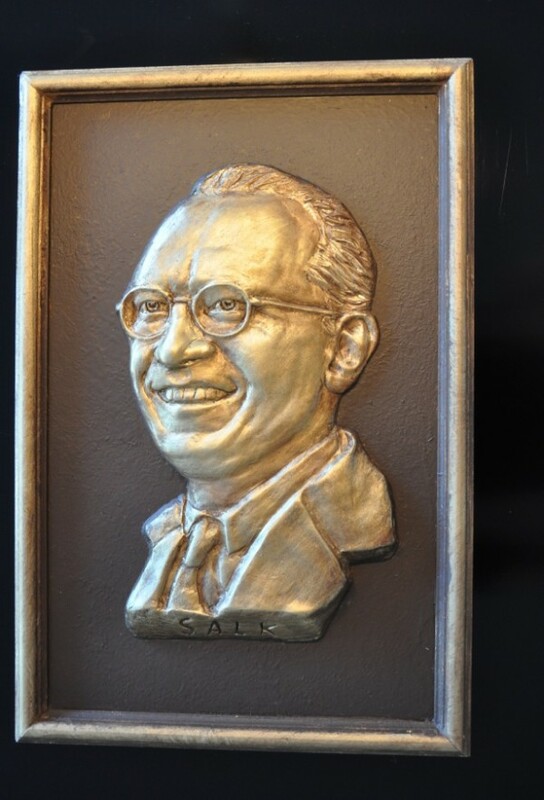 About 25 years later, Salk is awarded the "Medal of Freedom" by President Jimmy Carter. Boobus Americanus 1: I read in today's New York Times that the last remaining member of Jonas Salk's team that developed the polio vaccine has died. Boobus Americanus 2: I didn't know Jonas Salk was part of a team. Sugar: That'ss becausse he wass a frickin' low-life glory-hound who just ussed the research of others! Editor: Just like St. Albert Einstein. WHO IS BEHIND THE ARTIFICIAL HYPING-UP OF JEWISH SCIENTISTS -- AND WHY?